You know when you are running, and it’s one of those days when you just feel slow, you feel hot, and you’re using your sacred bits of water to splash yourself? Well, that was me today for parts of the Queens 10k. So I was about halfway and really in need of a boost… and then… there it was. The misting station. Ah! Yes! It was just past the 5k point, a point where both me and the guy beside me needed some encouragement. As we approached and ran through the sprinkles, we both giggled and sighed, then kept on moving with a little more oomph. Thank you NYRR for adding these little refreshing spray stations along the routes of the last couples of races. 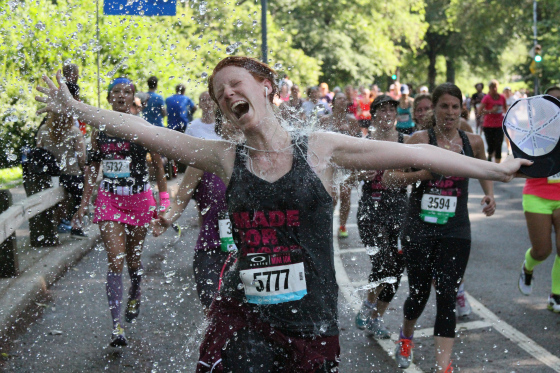 (This photo was the misting station at last weekend’s Oakley Mini 10k – love the joy on her face!). Running girl you got stamina !!! Love that misting! !